The purpose of the Aroostook County Transportation Study is to identify and evaluate transportation alternatives that will meet the Study's stated Purpose and Need. While the purpose and need for the study includes a number of diverse goals, the primary objective is to identify transportation improvements that would help stem the economic downturn that has occurred over the past several decades and spur future economic growth within the study area. The study area comprises the northeastern portion of Aroostook County and is bounded roughly by Route 11 on the west, the Canadian border on the north and east, and I-95 to the south. The Aroostook County Transportation Study has been divided into eight major steps. Economic Impact Study - Presque Isle Bypass. Preparation of an Economic Impact Study (November 2007, Adobe PDF - 400KB) to evaluate the potential economic impacts of a Presque Isle Bypass on businesses in the downtown Presque Isle area. U.S. Army Corps of Engineers (USACE) Highway Methodology Process. Preparation of a Phase I Avoidance document, including revised Basic Project Purpose (USACE approved Phase I, identifying range of alternatives to advance to Phase II, in October 2007) and Preparation of Phase II Permit Application (Caribou Connector completed in December 2007, Presque Isle Bypass completed in June 2008). USACE issued Public Notice. USACE identified Least Environmentally Damaging Practical Alternative (LEDPA) for Route 1-Route 161 Connector in Caribou in September 2008. Work towards consensus on LEDPA/Preferred Alternative for the Presque Isle Bypass by January 2010. View the Section 404 Permit Application for the Caribou Route 1-161 Connector (December 2007) and the Presque Isle Bypass (June 2008) Part 1 (download size: 10.2MB) | Part 2 (download size: 17.0MB). Final Environmental Impact Statement. The Final Environmental Impact Statement (FEIS) for the overall Aroostook County Transportation Study and the Route 1-161 Connector in Caribou was released in December 2009. 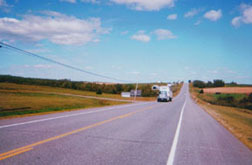 In February 2010, FHWA issued a Record of Decision for the Aroostook County Transportation Study FEIS ( Tier 1 ROD) and the Route 1-161 Connector in Caribou FEIS ( Tier 2 ROD). A separate FEIS for the Presque Isle Bypass is expected to be released in the Fall of 2010 followed by the issuance of a Record of Decision by the FHWA. View the preferred corridor map. If you are experiencing problems when viewing this PDF (linked above), please click here to access each file individually. If you would like a copy of the FEIS on CD mailed to you, contact Lisa Standley. In order to view the documents included on this webpage, please ensure that the settings on your computer allow PDFs to be opened in the internet browser. To do this, open Adobe Acrobat. Go to Edit » Preferences. In the Preferences window, click on "Internet" and select "Display PDF in browser". The SDEIS was completed in June 2006, with public hearings held in August 2006. On August 31, 2006, the public comment period for the SDEIS was closed. MaineDOT has reviewed and responded to the comments received during the public comment period. View the FEIS-Response to Comments included in the FEIS. See Project News for details of the FEIS that was completed in December 2009. A Winter 2009 Project Newsletter has been prepared. View the latest Project Newsletter (Winter 2009, Adobe PDF). The Purpose of the study is to evaluate transportation alternatives that would improve the region's economy by improving transportation mobility. Aroostook County has an inadequate transportation system that limits access and mobility to, from, and within the county. Poor mobility in turn limits economic opportunity. There is a need to improve transportation access to, from and within Aroostook County and the surrounding provinces to improve access to jobs, reduce long distances and travel times for goods to market, and address issues of transportation system continuity. Improve access to multi-modal (air and rail) facilities. Reduce the perception of remoteness that contributes to the perception that there are "two Maines." © 2000-2013 VHB, All rights reserved.